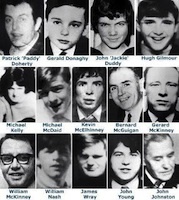 Forty years ago today, 13 Catholics in Derry were shot dead by British paratroopers. A fourteenth man died from his gunshot wounds five months later. For years, what came to be known as Bloody Sunday was held up by many as an indictment of British rule in Ireland. Yet now it is used to justify British rule in Ireland. One of the most subtle and least-criticised coups carried out by the British state in recent years has been its moral appropriation of this atrocity, its transformation of Bloody Sunday from evidence that Britain plays only a destructive role in Ireland into an event which shows that British largesse, especially of the therapeutic variety, is still required in that apparently childish nation. The 14 men who were killed, seven of whom were teenagers, had been part of a crowd of 10,000 protesters. They were demanding equal rights for Catholics in housing, employment and voting, in a sectarian, Protestant-run statelet where Catholics were two-and-a-half times as likely as Protestants to be unemployed. In the four years before Bloody Sunday, since a fledgling Catholic civil-rights march in Derry in October 1968 was brutally broken up by the local police force, tensions had been running high in Northern Ireland. The British Army arrived in August 1969 to back up Britain’s local Protestant allies and internment without trial was introduced in August 1971. All marches were banned. It was against this backdrop that thousands of Catholics in Derry defied Britain’s emergency laws and marched for civil rights on 30 January 1972. The response of the paratroopers transformed the conflict. The belief of many Catholics that it was possible to reform Northern Ireland, to make it a more equal place, was shattered by the brutal force with which Britain seemed determined to preserve the sanctity of one of its few remaining colonies. Huge numbers of nationalists were radicalised by Bloody Sunday, coming to believe that it was only through the expulsion of British forces from Northern Ireland, and the unification of Ireland, that proper freedom could be attained. There followed a long, bloody war between the IRA and British military forces. In recent years, however, the history of Bloody Sunday has subtly yet dramatically been rewritten. Through academic revisionism and political opportunism, and particularly through the 12-year Bloody Sunday Inquiry overseen by Lord Saville of Newdigate from 1998 to 2010, Bloody Sunday has been turned from an historic event into a private tragedy, from an incident in a war that had been brewing for four years, and which continued for another 20, into a freak encounter between trigger-happy paras and innocent Catholics. Bloody Sunday has been wrenched from its historical context and transformed instead into a kind of one-off tragic drama starring evil British soldiers (who were severely chastised by the Saville Inquiry) and mostly decent Catholic protesters (the victims were exonerated by Saville and their families were apologised to by David Cameron). The impact of the rewriting of the Bloody Sunday story by the modern British state has been twofold: first, it has helped to dehistoricise that day; and second, it has helped turn it into a vehicle for therapeutic intervention into the lives of people in Northern Ireland, who apparently require a new army of British-funded experts to help them come to terms with their tragic pasts. The removal of Bloody Sunday from history can be seen most clearly in the conclusions of the Bloody Sunday Inquiry. Unlike the initial inquiry into Bloody Sunday, carried out by Lord Widgery in 1972 and widely written off as a whitewash, the more recent Saville Inquiry is seen as providing the Official Version of Events. Yet the key accomplishment of Saville was its abstraction of Bloody Sunday from the historical flow, its removal of 30 January 1972 from any sense of continuity between 1921 (when Partition was enforced) and 1968 (when northern Catholics first started rising up) and the early 1970s (when the British state responded with martial law). Instead, through inviting the families of the 14 victims to express their emotions in a rarefied chamber while simultaneously slapping the wrists of the soldiers involved, Saville reduced Bloody Sunday to the super-violent equivalent of a playground fight that called for a good headmaster to intervene and make amends. Courtesy of Saville, Bloody Sunday is now understood as a day on which certain British soldiers went OTT (Saville said the paras ‘lost control’), causing great distress to certain Derry families. Of course Bloody Sunday is an occasion of private grief - but it is also an historic event with causes and consequences. All of that has been airbrushed from the record by a process of official remembering which has reduced Bloody Sunday to something like the Dunblane massacre, only involving paras and Catholics rather than a lone gunman and schoolchildren. Saville didn’t whitewash the individual paratroopers’ responsibility for the events, in the way Widgery did; no, he partook in a far more profound form of whitewashing, turning Bloody Sunday from a political quake into an out-of-control streetfight. In focusing attention on the misjudgement and moral turpitude of individual soldiers, Saville whitewashed the historical role of the British state in using force to deny democracy and equality in Ireland. Indeed, so thorough has been the lawyerly makeover of Bloody Sunday that the British state, the author of the atrocity, can now assume its moral authority in Ireland through taking an apologetic approach to such tragic historic events. In scolding some of its soldiers and offering apologies to their victims, the British state has extricated itself from the history and politics of Bloody Sunday, taking the elevated position of a dispassionate fixer of past wrongs. Today, one of the key ways Britain justifies its continuing presence in Ireland is as a moral manager of the past, a facilitator of reconciliation between hurting communities - and its moral hijacking of Bloody Sunday has been a key plank in this rehabilitation of its rule in a neighbouring nation. In response to the controversy over the fact that the Saville Inquiry cost a total of #200million, Lord Eames, the Lord Archbishop of Armagh, said no price was too high when it came to combatting the ‘psychological trauma’ inflicted by such events, because ‘this hidden consequence or legacy of The Troubles is probably just as desperate a need to meet as any of the physical’. It was a revealing statement. Bloody Sunday has become bound up in a new theory which says that certain ‘out of control’ events in the war of 1969-1994 didn’t only cause trauma to individuals and families, but also ‘national trauma’, which it is incumbent upon Britain’s lords, lawyers and psychologists to address. Indeed, Lord Eames himself is co-chairman of the Consultative Group on the Past, a vast outfit devoted to working out how to deal with the psychological ‘legacy’ of The Troubles, while untold amounts of money have been pumped into investigating the scale of ‘national trauma’ (one academic survey estimated that 22 per cent of people in Northern Ireland are still struggling to cope mentally with events from the war). The Office of the First Minister of Northern Ireland has produced a report titled Living With the Trauma of The Troubles, which implores all political actors to recognise the ‘long-term social and psychological effects of these traumatic events’. What we have here is a profound reorganisation of Britain’s political authority over the Irish people. Where once Britain justified its rule in Ireland in moral or nationalistic terms, talking about the need to protect the Protestants in the North from being swallowed by an ‘intolerant’ Irish Republic, now it justifies its presence in therapeutic terms, presenting itself as the neutral provider of psychological repair to suffering people, including those whose suffering was caused by British elements who ‘lost control’. This new approach reproduces many of the prejudices of old, only in more PC lingo: once, British propagandists presented the Irish as a fickle, childish people, not up to the serious business of controlling their own affairs; now, they depict them as a traumatised, damaged people, requiring the constant care of brain experts and bishops funded from the British purse. Both historically and today, Irish people’s political capabilities and moral robustness have been cast into doubt by outside actors keen to assume moral authority over them. Bloody Sunday was not a freak incident in which paras ‘lost control’ - it was part of a war by the British state to maintain control over its colony of Northern Ireland. And now, 40 years on, that same tragic event is used by the same British state to reassert, in therapeutic terms, its governance of Northern Ireland. Historians will surely look back in amazement at how cynically and successfully Britain took moral ownership of Bloody Sunday.